With our patent-pending automated technology, TrellaGro LST™ uses a low-stress training technique to gently train tall plants to grow horizontally vs. vertically. Now you can control plant height, increase yield, track plant growth rate and more. 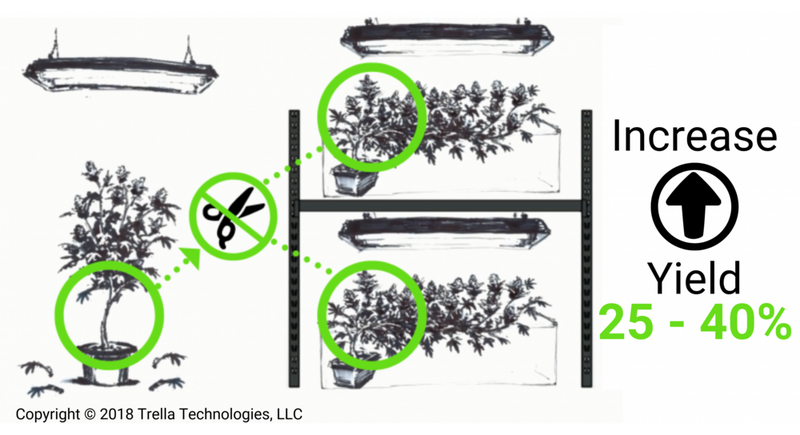 Horizontal growing through low stress training allows growers to keep all branches intact, creating maximum yield. Click here to learn more. Increase yield and reduce grow time: With horizontal plant training, every branch gets optimum light– potentially increasing yield per plant by more than 25% when compared to manual methods. In addition to higher returns, Trella’s automated system uses gentle low-stress training (LST) to help you grow healthier plants in less time, without the need for pruning and trimming. Indoor horizontal training, by design, allows users to grow their favorite cannabis strains, fruits, or vegetables year-round. TrellaGro LST outperforms existing plant training methods. With a higher yield, and/or shorter growing cycles, commercial cannabis cultivators can experience an increase in their annual harvest output while savings costs.